It’s weekend again and you can get an impression why Vancouver is also called “Raincouver”! It’s rainy and this weekend, there is only a small possibility to see the sun! That’s why you should especially focus on indoor activities. This Friday you should check out the Fly over Canada at Canada Place. It’s a multi-dimensional theatre with a Halloween theme. BC residents save 25% if they use the promo code LOCAL25. So if you planed to go to the FlyOver then you better do it this Friday! As usual you will also get the chance to go to Friday Night Life Music in North Vancouver again. It is taking place at 3201 Mountain Highway. And who wants to prepare himself for Halloween, can check out one of Vancouver’s Haunted Attractions! On Saturday the Kitsilano Autumn Fair is taking place. It is a small but free community event both outdoors in the street and indoors at the Kitsilano Neighbourhood House at 2305 West 7th Avenue. The event includes a pancake breakfast, bouncy castle, children’s activities, pumpkin patch, live entertainment and a market. The Autumn Fair fills an entire block with street vendors, food trucks, carnival games, a pumpkin patch, and local musicians. You can step inside Kits House to check out a haunted house, a pancake breakfast, and our Kits Kafe! Saturday is also a Hockey Day. 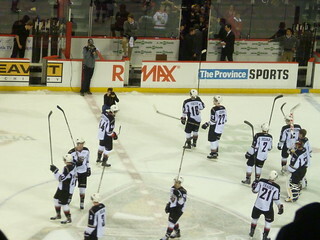 The Vancouver Canucks as well as the Vancouver Giants will play in Vancouver. The Canucks play against Pittsburgh Penguins at Rodgers Arena and the Giants against Seattle at Langley events centre. Sunday a lot of Halloween events are taking place again. So you can choose again between scary and family-friendly activities! In my opinion you should check out the VanDusen Glow in the Garden. It’s taking place at VanDusen Botanical Garden. At the event, in most years, there might be half a dozen or so skeletons scattered around the place, but far less scary stuff than almost any other spooky event in town, which makes it especially popular for young families and tiny folk with nervous dispositions. It’s wonderful for people of all ages! However, I hope everyone will have a very good weekend! “You know it’s Friday when the weekend comes knocking at your front door.” (Anthony T.Hincks) The week is nearly over and it is going to be weekend again. Soooo…….. it’s time again for some weekend activities! Friday evening Ellen DeGeneres is stopping in Vancouver for her show. The famous American comedian is going to entertain you the entire evening. So if you have some bucks to spend, then go to the Rodgers Arena and enjoy her show. Instead of laughing, you also can go to the BC Place and support the BC Lions against Edmonton Eskimos in the CFL. Maybe you prefer an alternative without spending so much money, then you should visit North Vancouvers Craft Beer week. This Friday is the start of the event. The week features beer specials, live music, brewery tours and people having fun at various venues throughout North Vancouver. Lost Souls of Gastown – a guided walking tour with Forbidden Vancouver through the streets and alleys of historic Gastown. VanDusen Glow in the Garden – lit-up carved pumpkins and Halloween activities at VanDusen Garden. In 2018 the family-friendly event is even bigger than last year and the theme is Hänsel and Gretel. Mission Nightmare Haunted House – a popular community-run Halloween attraction in Mission with proceeds benefiting a local charity. The Haunt of Edgemont– an amazing attraction at a family’s home in North Vancouver that’s open to the public by donation. Something you definitely consider about is supporting the Canucks in the Rodgers Arena. They play against the Boston Bruins. Scaaaaaaaary …Halloween is coming soon and everybody is preparing themselves for that. So you should do it too by using the Sunday ! So why not combining a visit of Fly over Canada and Halloween? At the moment a Halloween theme is taking place in this multi-dimensional theatre at Canada Place. So check it out! Do you prefer more suspense? Then go to River’s Edge: Home for the Criminal Mind. It’s a haunted attraction at the Mission Raceway Park in Mission. Starting the week on a Wednesday sounds pretty cool, right? Well, wait till I tell you about my weekend, because that was even cooler than just having a three working-day week. On Saturday morning, I met 27 of you guys for our four-day trip to the Rocky Mountains. 6.45am seems pretty early, but the time that was lying ahead of us was worth the hustle of getting up so early. The bus took off at 7.30am and our adventure started. We got to know our West Trek tour-guide Hayley and bus-driver Lucien, who made this entire trip so much fun! Thank you to the two of you. Our first stop was Hope, where we had some fun times at the playground and could just walk around the picturesque village. Aboard the coach again, we played some games, listened to music and started to get to know each other better. We had lunch in Kamloops and made a short stop at the Spahats Falls. And so, after a 9-hour drive in the bus, we finally arrived at our first night’s stay in Valemount. The evening activity there: Hockey in the Rockies. Teamed up and ready to win, both the “Pride Dragons” and “Tigers” chased the ball to score some goals. While some of you were still playing, I settled down at the bonfire and enjoyed the last hours of our first day. We had some easy conversations, listened to Hayley playing the Ukulele, sang along to ‘Riptide’ and ‘Country Roads’ and just enjoyed the view of the mountains. At around 1am I decided to get some sleep, because I knew that we had a tight and busy schedule the upcoming days. On Sunday morning at 7.45am, it was time for us to depart from Valemount. It was a stressful morning and I was quite relieved that I did not have to sing when I boarded the coach (the West Trek rule is that the person coming late has to sing a song for the entire bus). We had our first scenic Rocky Mountains stop at Mt. Robson. It is the highest mountain in the Canadian Rockies and it gave us the opportunity to have a breakfast with a view. Afterwards, we all had the chance to take beautiful pictures with this giant mountain in the background. We boarded the bus again and drove to our next stop: The Athabasca Falls. Even though we had to leave quite soon after we arrived, everyone had the chance to take a stunning picture of and/or with the falls. But the next stop promised some more breathtaking views: Athabasca Glacier. Already on our way to the icy phenomenon, Hayley taught us about the formation of glaciers and the relation to icefields. From the distance, we could see the Columbia Icefield, which is one of the biggest accumulations of ice south of the arctic. Some of us went up the glacier in a special bus called snowcoach. Personally, I did not join. Some of you just spent the time at the foot of the Glacier with me, having lunch and hiking through the moraine. After the “Snowcoach-Group” returned, we boarded the bus again and continued the trip to Peyto Lake. Wow, what a beautiful place! The water was turquoise blue and the view was just breathtaking. Another perfect location to take stunning pictures your friends will envy you for. 😉 After this stop, we just had one more task to fulfil: The Polar Bear Swim in Bow Lake! The bravest among us got ready to be cooler than they’ve ever been before. Of course, you’ve always been cool, guys – but I think you know what I mean. So, to visualize it: 20 crazy INTERNeX-people running into ice-cold water, screaming at the top of their lungs and cheering with the kicking-in of adrenalin. FUN! Great job to those who did it! I really enjoyed it and can only recommend doing it. Back in the bus, we were all looking forward to making it to our accommodation for the night in Banff: a cute, beautiful little village. We spent the evening having dinner, shopping souvenirs and getting ready for our night out. And besides celebrating the great group and the new friendships we made, we also had a special anniversary that night: Henrike turned 19! Happy birthday, again. I hope you had an unforgettable night. I walked back to the hotel at around 1am, I did not want to be too tired the next day. To not overwhelm you with everything, I will tell you about the last two days tomorrow. Make sure you don’t miss out on the blog post! I hope to see you tonight for PuB NiGHT at the Beaver Bar. After shutting down the computers at the office on Friday afternoon, the weekend could start. We decided to behave like real Canadians this night, which means only one thing: watch hockey! So, Nadine and I headed to the sports bar Malone’s to meet some of you. At the moment, the playoffs of the Stanley Cup are broadcasted literally every day and as you can imagine, the pub was crowded. Everyone was following the intense game of one of the two Canadian teams in the competition, the Winnipeg Jets. Some fights later, we as well as the Jets could celebrate. We took it easy and called it a night after a few drinks. The view outside the window on Saturday morning did not seem that promising. Time to escape cloudy downtown and take a walk in a tropical forest. That is possible in Vancouver? Yes! The Bloedel Conservatory is located right at the Queen Elizabeth Park. It feels like entering another world, warm and colourful. While walking around, Nadine, Angy and I could spot many exotic birds and plants. All information about the beautiful parrots and trees are mentioned in a guide that you receive when entering. Outside of the conservatory, I could enjoy a beautiful view of Vancouver and a little park with many flowers that are starting to flourish now. At the other side of the park, the preparation for the night began. We planned to visit the event that was happening later: the Spring Light Festival. As it was still too bright and early, we used the time to visit the Oakridge Mall, before heading back to the park. Lucky as we were, it started to rain the moment we walked out of the mall. However, we were happy to meet some of you hiding under your umbrellas. We followed the path that was guided by lights in all kinds of ways. It was nice to see the cherries and lanterns highlighted in colourful spotlights. After a while, the ground became all muddy and we were completely soaked, so we decided to warm up again. Famous place to do so is the pub Bourbon where we danced the night away. I admit that it was quite tough to get out of bed on Sunday morning. But there was a good reason to leave the house again. Of course, I wanted to meet you for our tour in the Rogers Arena. A guide welcomed us in the empty hallway and we entered the heart of the stadium. But something was different than the last time I was there to see a game of the Canucks. There was no ice! Since the season is over, it already got removed so that the concert season can start. The tour continued to the media and press box, the hall of heroes and the luxurious suits. As a highlight of the tour, we could even enter the locker rooms of the guests (quite basic) and the Canucks (not basic at all), where we could still spot the gear of the famous Sedins. I was impressed by the diverse places you can see a game from and the huge organization behind the scenes. Since everyone was hungry after this exhausting tour, we visited Malone’s again for lunch and hockey, of course. I had another great weekend with many of you! See you Wednesday at Steamworks Brewpub for our weekly PuB NiGHT! Today is Friday, which means it’s almost weekend again! And guess what? It’s supposed to be another rainy weekend in Vancouver. Luckily, there are plenty of activities that can be done indoors. So, here are my suggestions for the weekend. Listen up hockey fans: the Stanley Cup is on. There is a total of 8 games to watch during the upcoming two days. Four on Saturday and four on Sunday. But where? Well, you could go to one of the many pubs that are screening the games, for example the Lamplighter or Malone’s. Or you could invite your friends to your place, have cold beer and chips ready and watch it on TV or on your computer via cbc.ca. For those that would like to enjoy some nature, but do not want to be outside in the rain: no worries! There’s a solution for that problem too. The Bloedel Conservatory is then the place to be. Within the dome, you can find three different climatic zones: Tropical, Subtropical and Desert. 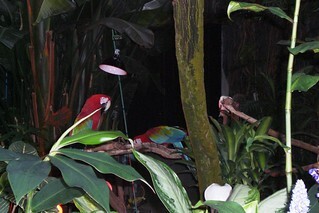 In total, you can find more than 120 free-flying exotic birds and more than 500 exotic plants and flowers. Enjoy the warmth and the beautiful nature on both days (and any other day of the week) from 10am until 5pm. The entrance fee is $6.50 only (tax not included). And for the tough cookies of you that want to be outside no matter what: The Spring Lights Illumination is taking place in the Queen Elizabeth Park on Saturday evening only! Many projections and a walkthrough experience are awaiting you from 8pm until 10pm. The best part: the entrance is free! Enjoy your rainy weekend and I hope to see many of your faces at the Rogers Arena Tour on Sunday! If you didn’t sign up, but would still like to join, just meet us at 1pm in front of the Canucks Team store which is located at gate 6! See y’all! “Zie ginds komt de stoomboot…” You don’t know that lyrics? Could be, it is the dutch song we sing when Sinterklaas is arriving in the Netherlands. And Saturday was that day. Because we are some Dutch people, we, uh I, did want to celebrate this great party on Friday, so we celebrated it with Sinterklaas music and pepernoten. Everybody loved it so much *kuch*. Saturday was match day. Canucks were playing against St. Louis Blues. We met up in front of the Rogers Arena and found our seats. After the national anthems of the USA and Canada the game began. In the break it was time to see how lucky we were tonight and we bought some 50/50 tickets. Spoiler alert: We won nothing. The rest of the game was exciting. We saw some fights and the teams were quit even. It was a tie, but in the overtime the blue ones scored one more time. That meant St. Blues won the game. Afterwards we met the rest of INTERNeX at the Bourbon and we had a lot of fun the rest of the night. Sunday was recovering day. Netflix all the way. After all it was a good weekend. How was your weekend? Tell me everything about it next PuB NiGHT in Malone’s. Not 5 days, but just 4 days and the weekend is already here. That also means one day less to figure out what to do this weekend. No worries, I am here to help you out. On Saturday the Canucks are playing and we are watching. It will be a nice game to see. But also other activities are taking place. Find out below what is going on in and around Vancouver. Do you already have some Christmas feelings? Good. From this week on the INTERNeX Office Christmas Carol Tour takes place. For just 50 cents, you can watch our Christmas tree while professional karaoke singer Bart will sing you a Christmas carol with reindeer ears on his head and you can enjoy a chocolate as well. What a great deal! If you want something more professional (I can’t imagine) the first Christmas Craft Fairs are taking place this weekend. Go to the Christmas market at Hycroft, the craft market at Chiliwack, the Christmas show at West Coast or the Holiday Bazaar in North Vancouver. If you want you can do a crawl this weekend. No, not a pub-crawl, but this time a Culture Crawl. In 80 buildings in the area over more than 500 artists will show their work. Is art not your thing? Ok, what about hiring a car and driving to the Fraser Valley for the Bald Eagle Festival? Take your camera with you on 18 or 19 November and spot some of these great eagles. You get the beautiful views for free as well. Enjoy nature walks, boat tours, wildlife and of course hundreds of bald eagles. I will see you guys who joining the Canucks game on Saturday, and the others perhaps afterwards. Whatever you decide to do this weekend, you have to promise me one thing: have fun!